Disclaimer: It’s heartless to eat endangered animals. In compiling this list, I chose to feature chefs and restaurants that source meats responsibly. Media sources regularly report on the evils of gorilla and elephant bushmeat, and it’s worth looking up which species are endangered before booking a hunting safari. It is exceptionally rare to find endangered animals on the menu in a South African restaurant. 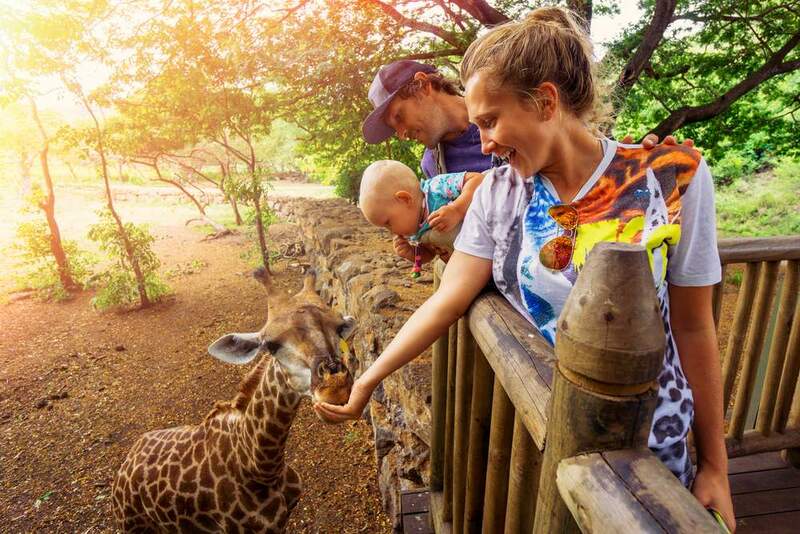 With so many exotic animals to see and eat, South Africa convinces many travelers to indulge their wilder sides. From ostrich to zebra, bushmeat can be delicious and healthy. In each of the sections below, an exotic meat is explored and an exceptional restaurant is recommended along with a game park. In this way, animal lovers can spend the day hanging out with their dinner, then return to eat it! 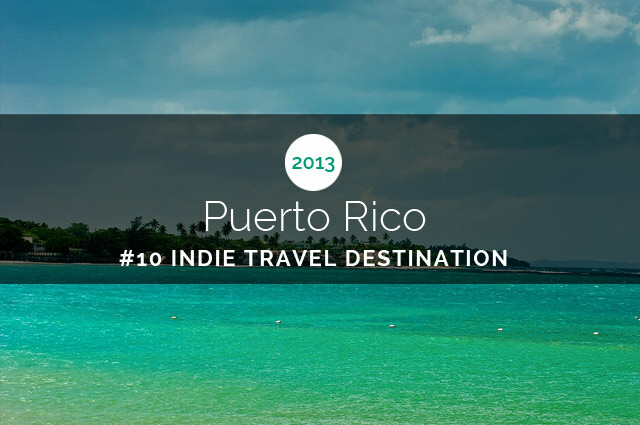 Note that many of the restaurants featured below are fine-dining establishments and their menus change seasonally. Call ahead to ensure your exotic meat of choice is present. I’ll take an ostrich burger over a beef burger any day. An incredibly versatile red meat with half the fat of chicken, ostrich makes a delicious a steak, burger, carpaccio, pâté, and more. Moreover, an ostrich egg is the equivalent of 24 regular chicken eggs, and its yolk is exceedingly rich. Ostrich is a popular menu item all over South Africa, and a concentration of ostrich farms can be found in the town of Oudtshoorn in southern South Africa. 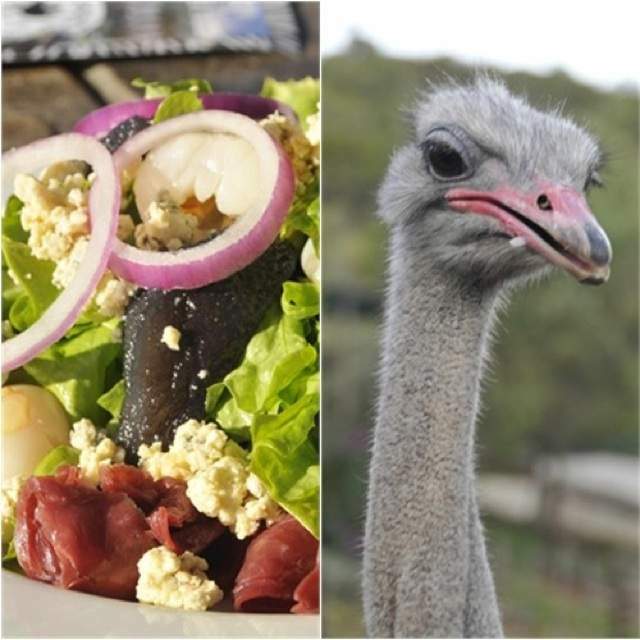 Buffelsdrift Game Lodge, located just outside of Oudtshoorn, serves a succulent ostrich carpaccio as part of its “The Buffelsdrift Salad” ($10) and its 200g Flame Grilled Tender Ostrich Fillet ($12) has a similar texture to a sirloin tip side steak. Did you know that ostriches mate for life? Did you know they can live to be 80? Just up the road from Buffelsdrift, the Cango Ostrich Show Farm welcomes visitors daily, and its tour is fun and educational. During the tour, guests get to learn about ostriches, pet ostriches, ride ostriches, and even see a dwarf ostrich–all for $8.50. A type of gazelle, springbok tend to look like tiny rocking horses frolicking across the African plains. Farmers prefer raising springbok to lamb because it eats less grass and causes less damage to fields. Springbok is typically served in steak form, and to me, it tastes similar to venison. Located in the famous town of Stellenbosch in the Stellenbosch wine region, the 5 Ryneveld Restaurant offers an excellent half-pound springbok steak for $15. Chef Addington Mahurayi, who has worked in 5-star hotel restaurants in South Africa and Zimbabwe, seasons the meat with course salt and grills it over an open flame. The true springbok flavor shines through. It is served with roasted potatoes and seasonal vegetables with a balsamic reduction artistically dotting the rim of the plate. Visitors will find springbok in most game reserves, including the Sanbona Wildlife Reserve, which offers game drives. The reserve is located in the Western Cape on the famous Route 62. Ugly to look at, delicious to eat! Warthog has a similar flavor and texture to pork, and at the fine-dining Savoy Cabbage restaurant in Cape Town, Chef Peter Pankhurst serves a perfectly cooked Fennel-Dusted Warthog Loin with Bashed Neeps and Tatties, Onion Marmalade, and Sour Fig Syrup (just in case you’re wondering, “Neeps and Tatties” is a mash of turnip and potato) for $20. After being put into a brine for several days to relax it, my warthog was very tender, and the licorice-aroma of the fennel flower took me away to Tuscany, where wild boar and fennel flower are a common combination. 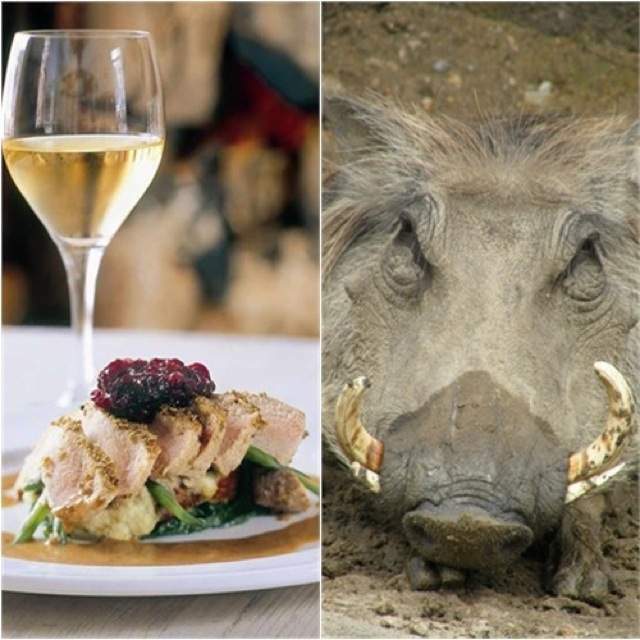 Caroline Bagley, owner of Savoy Cabbage, says that the restaurant uses only free-range warthog, and, feeding on the natural food of the fields, it is hormone free. “The only difference is that the farms have no predators,” said Caroline. Except us, I suppose. Warthogs don’t like to be near people, and they’re most commonly seen running away with their tails standing straight up in the air. However, the Hluhluwe Game Reserve has roving herds of warthogs, and it is the oldest game reserve in South Africa. You’ll find it in the KwaZulu-Natal province. Some believe that kudu, an African antelope, is the world’s best-tasting game meat. Kudu can weigh up to nearly 700lbs, and their horns, which can grow up to three feet or longer, are a common ornamentation in South African homes. 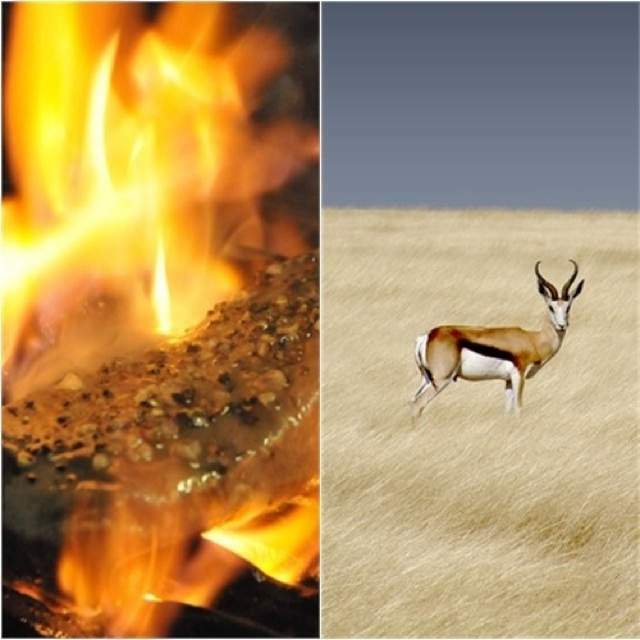 A very lean meat, kudu is served as a steak or as biltong, a type of cured meat. 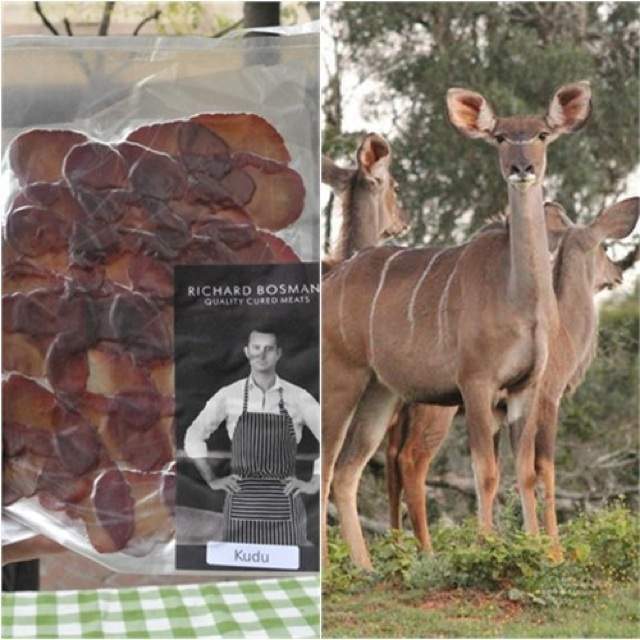 Richard Bosman’s Quality Cured Meats produces an excellent kudu biltong that travelers can find at the Earth Fair Market in Cape Town. The meat is ruby red and tastes quite good on its own. The Earth Fair Market takes place Thursdays in Cape Town’s St. Georges Mall from 11am-3pm. The Plettenberg Bay Game Reserve, the largest game reserve in the Southern Cape, is a great place to spot kudu. Take a 4×4 safari, or, to get really intimate with the animals, take a safari on horseback. The Plettenberg Bay Game Reserve is located along the famous Garden Route, which runs the southern coast of South Africa. In general, giraffe is not a common item on South African menus. It’s a controversial subject, particularly because a few subspecies of giraffe are endangered. 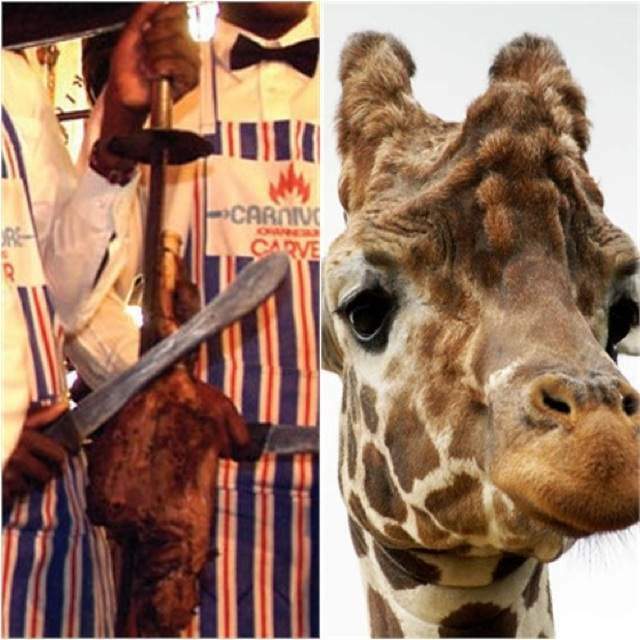 Aiming to treat giraffes responsibly, South African restaurants obtain giraffe meat through registered culling programs. A culling program removes animals from overpopulated areas, usually South African game reserves. The Sabi Sabi Private Game Reserve comprises the southwestern section of Kruger Park, and it is a five-hour drive from Johannesberg. The Big 5 Game (lion, African elephant, Cape buffalo, leopard, and rhinoceros) are native to the fenceless reserve, and Sabi Sabi offers guided bush walks, Land Rover safaris, and luxury safari lodges. Wildebeest, also called gnu, is famous for its annual migrations, during which 1.5 million wildebeests travel approximately 1,800-miles roundtrip from the Serengeti plains to Masai Mara, Kenya. Wildebeest weigh between 220 and 330lbs, and the blue wildebeest is typically served as a loin or shank. 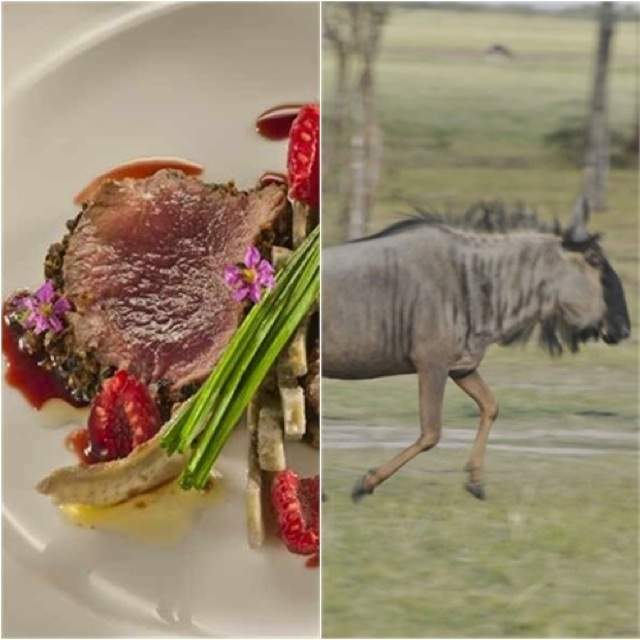 In Cape Town, Chef Harald Bresselschmidt serves a Seared Wildebeest with Pepper and Coriander Crust at Aubergine Restaurant. Aubergine Restaurant was named one of the top 100 restaurants in the world by Restaurant Magazine in 2009. Chef Bresselschmidt marinates the meat in juniper berry dust, savoury herbs, orange rind, and a splash of gin, then he sears the loin lightly in brown butter to caramelize the natural sugars. He then bakes it to medium rare and allows it to rest for 20 minutes. Before serving, he flash heats it under the grill then slices and serves it. He says that, in general, wildebeest pairs well with dried or sautéed fruit, so long as it isn’t overly sweet, or savoy or red cabbage. “The meat is generally not too gamey in taste, and it pairs well with our own Kalahari truffles,” adds Chef Bresselschmidt. Inverdoorn Game Reserve has the largest concentration of wild animals near Cape Town; it is a two-and-a-half-hour drive from the city. Wildebeests can be seen roaming free in large family herds, and the reserve is also home to lions, cheetahs, rhinos, giraffes, and African buffalo. Anga Lodge furnishes the reserve’s accommodations. 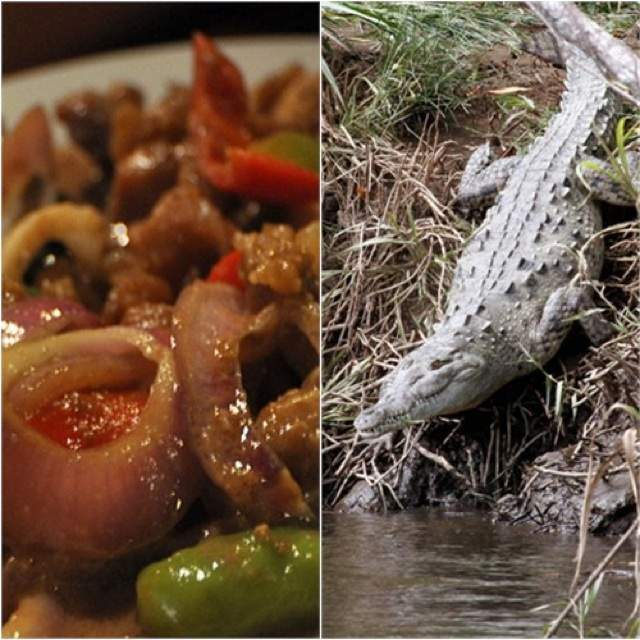 Crocodile, a somewhat bland, white meat, has a low fat content, and it tastes a little like fishy chicken. Most restaurants serve it in pieces, but tail fillet is also available. Mama Africa Restaurant and Bar is a wildly popular eatery on Cape Town’s famous party street, Long Street, and if you want to try several exotic meats at once, try Mama’s Game Grill (market price), which comes with crocodile, ostrich, springbok, kudu, and venison sausage. To focus on the crocodile itself, order Mama’s Crocodile Kebabs ($14), which are grilled with green and red peppers then served with peanut satay and rice. The char from the grill and the satay make this tough meat quite palatable. Crocodiles are a common site at game reserves, so why not head out to South Africa’s most famous game park, Kruger National Park? 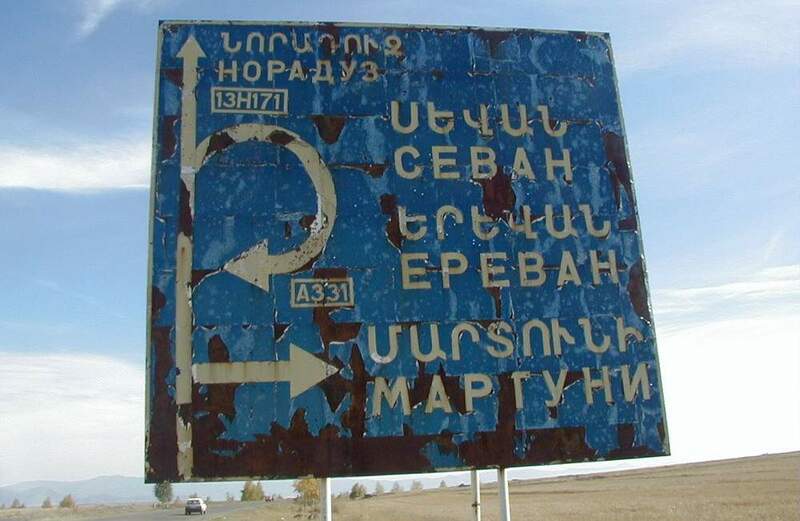 This massive, 7,523-square-mile park is located in the north of the country, a long drive from civilization. Here, visitors confront true Africa. 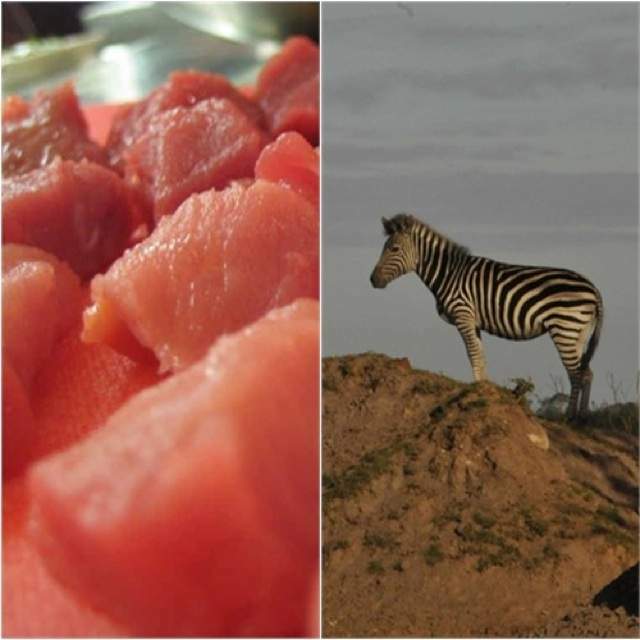 Two of the three species of zebra are endangered; however, the plains zebra is common, and its meat can sometimes be found on South African restaurant menus. I hear that zebra meat is very tender and comparable to beef, only slightly sweeter. I’ve eaten horse, and zebra sounds similar. Unfortunately, I couldn’t find a restaurant that served zebra during my time in South Africa. Savoy Cabbage has served zebra as an appetizer in the past, when Chef Pankhurst created a Sugar-cured Zebra with Drunken Soba Noodles, Pineapple and Habanero Chilli Salsa. The Fairy Glen Game Reserve is the only safari near Cape Town with all five of the Big 5 Game. 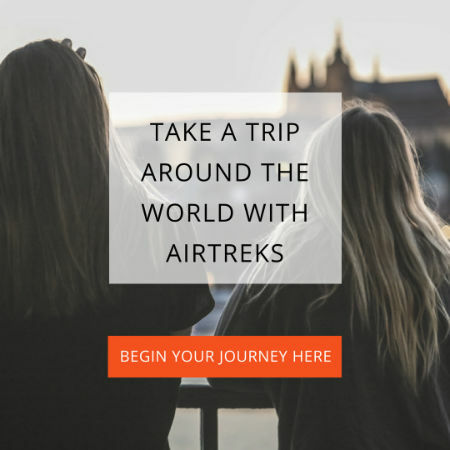 An hour from the city by car, the reserve offers 4×4 safaris, horseback safaris, and overnight accommodations.